Black Rebel Motorcycle Club is heading to Moscow, on a roll after an acclaimed new album, "Specter at the Feast," that has been hailed as a return to form. The seventh album partly takes inspiration from the death of bassist Robert Levon Been's father, an occasional contributor to the group. 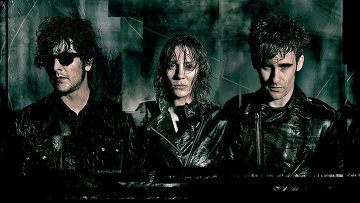 BRMC covered "Let the Day Begin," a song by his 1980s group The Call, in tribute to him. "My father had a lot of good records when I was growing up," Levon Been said in a phone interview. "The Smiths, Joy Division, The Band, Bob Dylan and The Rolling Stones. All the good s**t was always lying around the house. "We took two years writing and recording this [album], which is longer than we've taken on any of the previous records," he said. "We had the time to get it right, the way we felt like it should be. Sometimes, you can get forced to rush an album out before it's ready. "This new record is far lusher and braver than anyone had any right to expect," wrote music magazine NME. "This is a band who've found a second wind." The album was recorded on the same type of console as the band's eponymous debut record, marking a return to the group's roots, Levon Been said. Formed in San Francisco in 1998 and now based in Los Angeles, Black Rebel Motorcycle Club took its name from a motorcycle gang in the early 1950s movie "The Wild One," starring Marlon Brando. The trio, which also features singer/guitarist Peter Hayes and drummer Leah Shapiro, has put out seven studio albums inspired by various acts, from 1960s garage rock and psychedelia to 1980s indie rock. We "steal from every era that's got something decent to take," said Levon Been. "The '60s is pretty fertile soil, and there's a lot of good lessons to be learned from that time. "The argument is that everything that's come after is a little bit derivative of that time, but that's ignoring that it all came from the blues." Apart from material from the new album, Levon Been promised to play a mix of songs at the Moscow gig. "If we haven't been to a place for a while, we're trying to give people a little bit of every record," he said.